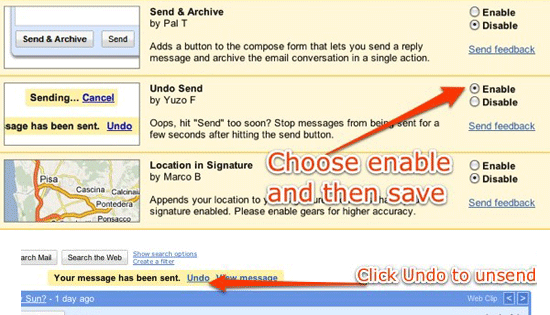 Gmail Undo Send: Fix You mistakes! Email is still king, that’s been proven by every marketer world wide until today. Millions of newsletters and email subscribers, Millions of people start their day with a cop of coffee and email reading. Well, now with the new option from Gmail programmers (Thank God for Gmail) There is a new option that you can add that will let you (Undo Send)! I know for sure that many of you will be racing to download this new option for the many mistakes that happened in the past (My self included) and it’s quite impressive what it does, within seconds after you hit send from your Gmail account, you can re-call that email message and it’s like it was never sent, so you can edit it and fix your mistake or add that extra line you meant to add before. There is a catch though, this option is only available for 5 seconds after you hit send, I’ll speak for my self when I say that, this is all I need, as I get a red alert in my mind within the 5 seconds after I hit send is there was something missing in this message or if there was a mistake in there somewhere! Previous Post2 New Twitter Services: WeFollow & Tweet TopNext PostWatch the Presidential News Conference Live here!